@motherofpearl1 wrote: So many people against Reylo....when if it becomes canon, it'll be how Rey truly becomes a 'Skywalker'. In all seriousness, is it wrong that I'm enjoying our corner now as it is today? I feel like I'm in the know before anyone else, and that's fun. Once it's out there in full capacity, there will be other reasons for celebration, but I also hope our community doesn't get an influx of "I love this story now that I know they're not cousins..."
Welp Mark Hamill just joked on American TV about Luke being a virgin and he's said that if you think he's gay, then he's gay. So are true Reywalkers gonna have a meltdown over those comments too? @snufkin wrote: Welp Mark Hamill just joked on American TV about Luke being a virgin and he's said that if you think he's gay, then he's gay. So are true Reywalkers gonna have a meltdown over those comments too? Here is the next thing Reywalkers will start saying.....Rey = Luke's hand clone baby confirmed. @panki - Confirmed! That's the most confusing theory ever because I'd swear it comes from David Tennant's first episode of Doctor Who, where it's obvious that Russell T. Davies is throwing in a bunch of references to Star Wars and Hitchhiker's Guide to the Galaxy. @snufkin wrote: I totally get the anxiety that Disney will go the safe/conservative route. The franchise is a cornerstone of global pop culture that people love for specific reasons *and* we're talking about a corporation where the bottom line rules all. They want to ensure a succesful roll out and use of the brand, so there's not going to be anything to alienate fans. That said, I went in to TFA with only a few spoilers and zero expectations. My interest in the OT was left behind in childhood so it was like seeing that universe and characters for the first time. All I knew about Rey is that she was waiting for her family to return and there wasn't anything that happened which made me ever think that she was a relative to any of the OT characters. What I very much did notice was Kylo's interest in her and that made me wonder if the plan was to have a straight forward hero-villain relationship. Or if it'd be something more complex. And by complex, I don't mean the joke you hear about how he stares at her after taking off the mask as "you'd only see a man looking at his cousin that way on Game of Thrones." What I've never been able to quite figure out is how many experienced movie goers didn't see it. I thought it was so obvious? Then talking to other people and reading on line I found out that it wasn't obvious at all to some. I am frankly puzzled by that. Because I didn't think J.J. was all that subtle about it. @Sacrebleu - me either! It never once entered my mind that she had any connection to Luke while watching the first time. But you better believe that it immediately entered my mind that Luke's nephew had a thing for her the moment he first laid eyes on her. And somehow I'm the crazy one or a bad fan for thinking that way. Or even a bad feminist, which is laughable because I'm a card carrying member of the Feminist Killjoy's Club. Same here. It still boggles my mind why the reylo "theory" (if you can even call it that) is still looked at as some niche idea that only a small specific corner is into. No words are spoken about it, and it is not verbally mentioned AT ALL, but facial expressions, longing stares and the camera angles say it all. So you can imagine when JJ said Rey's parents weren't in TFA how very UNSHOCKED I was. My mom, who made me grow up on soaps, saw it too. Heck, on the *rare* occasion I have any doubts, all I have to do is call her up and talk to her. She'll say it's true because she has eyes and they don't lie. Then she'll smack me around a bit for even questioning it!!! @snufkin wrote: @Sacrebleu - me either! It never once entered my mind that she had any connection to Luke while watching the first time. But you better believe that it immediately entered my mind that Luke's nephew had a thing for her the moment he first laid eyes on her. And somehow I'm the crazy one or a bad fan for thinking that way. Or even a bad feminist, which is laughable because I'm a card carrying member of the Feminist Killjoy's Club. For me, the strongest indication in TFA that Rey was not Luke's daughter was the blatant sexual innuendo in Rey and Kylo's scenes, not only chemistry between actors/characters, but how the director of the film specifically shot those scenes. There wasn't even a question in my mind that J.J. intended that. I still don't get how it was so completely missed by so many. I have a feeling I never will. What Rian intends remains to be seen. I really hope he didn't drop the ball. Same goes for me. I watched TFA with zero expectations even though I was a fan of the franchise ever since I was a little girl. Not for a minute I thought "oh, she's Luke's daughter!" @sacrebleu - they've said that Rian got to see the early cuts of the film and made requests for JJ to change things in order to keep things consistent between the two movies. So as with the director's cut DVD commentary, if he dropped the ball on that point, that'd be a huge WTF. @Piper Maru - even going in I'd read a couple summaries and everything said that she had grown up as an orphan and was waiting for her family. Which once I saw the movie, I was like "something bad happened, she got abandoned, and whomever left her there is dead." End of story. And I saw plenty of other details which I recognized right away as callbacks to the previous movies. But Rey's potential parentage being Luke wasn't one of them. I feel the same way....everyone from Palpatine, Kenobi, Dooku, Quinlan, Wedge Atilles, Thane Kyrell, random scavenger, death stick dealer, lost sith tribe member and church of the force missionary came to my mind at different points of time....but Luke being her father never made any sense. Good ole Disney, ruining the franchise again. Pablo, did anything in TFA suggest Rey is a Skywalker? Sure there are people who expect or want Rey to be a Skywalker, but that doesn't mean LF/Disney are going to make it happen or that if it doesn't happen, SW is ruined. Hopefully LF/Disney gives the public the story they need (a good story) and not just the story they want. Pablo to Reylos: Go with what TFA tells you. Pablo to ReySkys: Nothing in TFA suggested that. WhatGirl wrote: Pablo to Reylos: Go with what TFA tells you. to all of the posts above! I have to be honest I had a moment of doubt: I do remember the exact moment: It was during the credits rolling in front me in the theater after I watched TFA for the first time. I had a moment of my brain working like crazy: with the two ideas clashing in my head. I went in with a slight idea that the new girl (Rey) could be Han & Leia's daughter and a new villain some disfigured, ugly Sith unrelated to anyone. During the movie: I noticed Reylo, at least Kylo Ren falling for Rey (by "pulling a Solo" during the interrogation scene) and I also fell into the trap of "this saber belonged to Luke and his father before him". Given the fast pace of the movie I completely missed the importance of the other part of Maz's words. The moment I drop off Rey Skywalker for good was Pablo's tweet on the timeline of "Jedi Academy" incident. From that moment it was clear to me that every possible explanation of Rey Skywalker has to be ridiculously convoluted. @Darth_Awakened wrote: to all of the posts above! Agreed, the theory that Kylo spared Rey and left her on Jakku after the incident at the temple was the ONLY leg Reywalker ever had to stand on. That could have been a fairly compelling, logical narrative twist, but as soon as any relation between Kylo's fall and Rey's abandonment was debunked and it was revealed Luke and Kylo spent a lot of time together hunting down Jedi lore while Rey was rotting on Jakku it should have been acknowledged all around that the ReySky theory no longer made a lick of sense. The sheer level of bizarre plot manipulations and random coincidences would shoot through the roof. Convoluted doesn't even cover it fully. Really, nobody knows Rey because nobody knows her, she wasn't mentioned at all in Bloodline because she's not relevant to that story and Ben and Luke were off doing their own Jedi training thing long into her years on Jakku because she was a nobody to them. They had no clue she existed. Pablo has had so many chances to debunk Reylo but he so cleverly tip-toes around the point and diverts attention to something else. He's seriously the master of "SQUIRREL!" What's more important - Pablo has been the same around Reylo since the day 1. Not only during his mellow-phases. 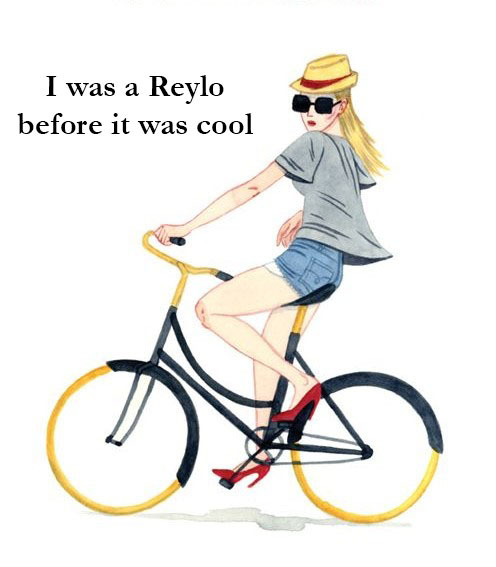 @Darth_Awakened wrote: What's more important - Pablo has been the same around Reylo since the day 1. Not only during his mellow-phases. Pablo clearly dislikes (1) Kylo as a villain (2) Reylo (3) shipping (4) JCF, Tumblr, Reddit and any kind of online forum. It would cost him nothing to say "lol Reylo is stupid, there's nothing in TFA that indicates that", just look what he did to Reywalker. And yet he keeps quiet, deflecting the questions. This is a big deal. It doesn't mean that a romance is coming, but that Rey and Kylo's interactions are relevant. @Piper Maru wrote: Pablo clearly dislikes (1) Kylo as a villain (2) Reylo (3) shipping (4) JCF, Tumblr, Reddit and any kind of online forum. It would cost him nothing to say "lol Reylo is stupid, there's nothing in TFA that indicates that", just look what he did to Reywalker. And yet he keeps quiet, deflecting the questions. Yesss! I think that Pablo would love to be the one to debunk Reylo if he could. Surely by now, everyone at LF knows about Reylo in the fandom, because they certainly know about ReySky and have thrown a bit of shade at it. If romance between Rey and Kylo weren't a big possibility on the table, I think we would've heard something more clearly negative regarding it by now... but everything remains mysteriously neutral... hmm. It causes Pabs physical pain that he can't destroy Reylo ala Godzilla and a city.